Disclaimer: The Effect Audio Ares II 8-wire was sent to us a sample in exchange for our honest opinion and does not have to be returned. We thank Effect Audio for this opportunity. I have received a few monitors over the last 12 months complete with out of the box, ‘do no harm’, Plastics One OFC cables. These are typically smooth but compressed sounding wires with limited dynamic range, naturally, I wanted better. When I ask for advice one name keeps popping up, Effect Audio’s Ares II. 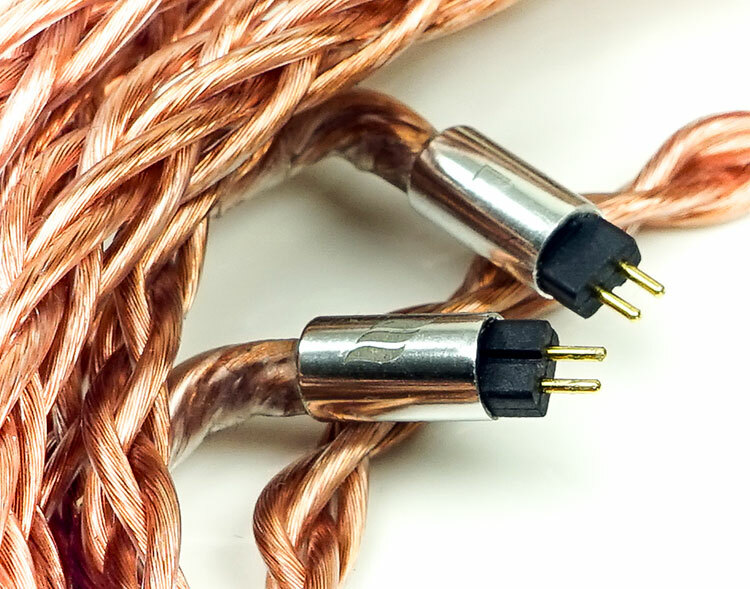 This is pretty much Effect Audio’s bread and butter entry level copper cable and by all accounts a fairly popular choice for those looking for their first upgrade. Price at very reasonable $149.90 it is not hard to see why EA might shift some volume on these cables. They also now have them in two versions 4-wire and 8-wire, the 8-wire being the Ares II 8-wire edition and a bespoke creation and not part of their Plus range. At a crude level, the Plus series is pretty much everything the Ares II can do just double the wire. Price? Not a huge increase at just $300.00 making it still one of their most competitive entry level 8-wire edition cables. Effect Audio has gradually built a definite roadmap with their cables over the last 12-18 months and also taken steps to upgrade just about every long-standing cable in their lineup. Ares II is no different being a substantial upgrade on the original Ares as well as coming in both 4 and now the 8 wire models. EA’s breakdown is now in three categories, Hall of Fame, Heritage and their Premium Series. Cables like the previously reviewed Lionheart are from the Heritage Series whereas the Thor II and Ares II are both from their Premium Series. It is the Premium series that could be viewed as the fastest moving cables with the more general appeal to the widest audience. Hall of Fame is for the purist and perhaps the richest, whereas Heritage is more transformational and “edgy” in the use and mix of materials. Within the Premium line, EA has split the cables into standard and Plus Edition. Up until this point, this split was purely 4-wire and 8 wire and all come at a slightly different price point with the Ares II+ being the entry-level 8-wire model at $219.90. 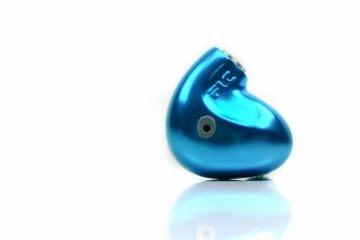 The Thor II+ is the TOTL at $569.90 for the 8-wire. 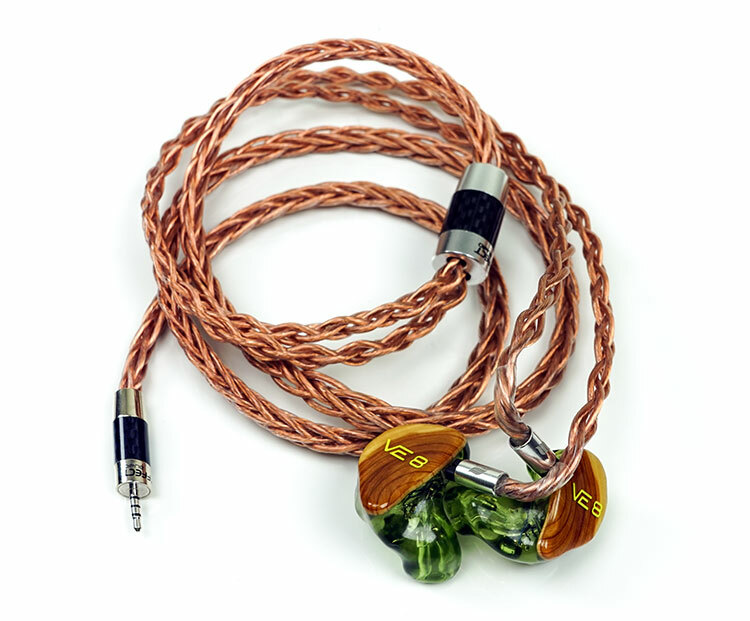 We reviewed the Thor II a while back and even in 4-wire configuration, it is a heck of a silver cable. The Ares II 8-wire is not a plus edition. 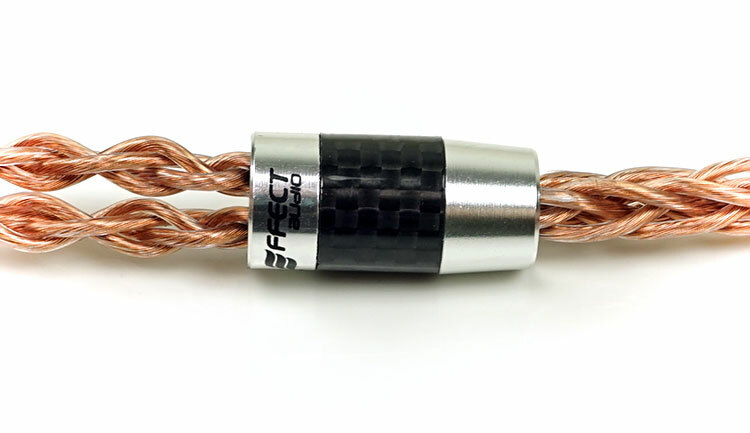 It is still a 26AWG wire but this time it is 8-wire and a new model in their bespoke line-up priced at $300. The price point of the Ares II 8-wire should still appeal to a lot of first-time upgraders who want to ditch that cheap OFC stock black braided cable that came with their high potential monitors. 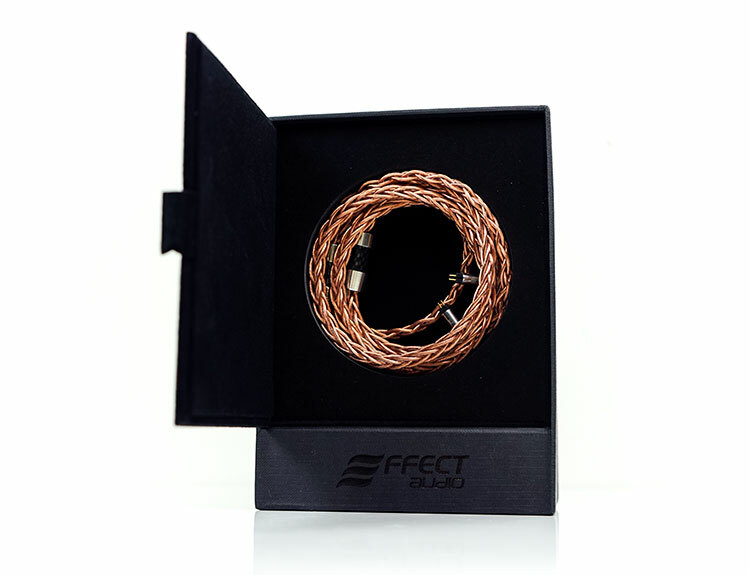 To buy it you must contact Effect Audio directly as it is under their bespoke range. The Ares II+ is comprised of a 26AWG UPOCC copper wire in a multi-sized stranded geometry design. This is basically double the wire count of the Ares II which is a 26AWG 4-wire model. Other than the additional wiring the two cables have a similar geometry build. Of course, 8-wire will make a fairly substantial difference in the performance. Almost all my 8-wire cables tend to sound much fuller and deliver more dynamic range than their 4-wire counterparts. The 8-wire configuration physically is right on the limit for me for IEM cables and should, in theory, give a better performance in terms of dynamic range and resolution. The size of each individual wire is the same at 26AWG’s 0.405mm diameter and 62.7 turns of wire, you simply double it. The geometry remains the same multi-stranding construction so not every wire is the same thickness in their geometry. The multi-strand Litz design is key here to the performance of the Ares II 8-wire (8W) and helps keep the general size of the cable in check. There are numerous advantages to working with Litz materials. The first is the ability to build a multi-stranded cable which has better high-frequency properties due to what is known as the “skin effect” where electrons travel along the skin of the wire. A Litz cable has a higher surface area and for that reason will deliver a better high-frequency performance. Litz wire consists of many strands of small diameter insulated wire. The idea of multi-stranding is to limit the effective diameter of each strand to the depth of the skin effect at a given frequency. By insulating each strand the current is forced to remain within each strand of wire. This has the effect of reducing the resistance at high frequencies. On high frequencies, current flows only in a thin surface layer of thick wire, so deeper layers are useless. Many thin wires such as Litz can carry high-frequency currents more quickly and efficiently than ones that are thick. Being a much bigger and thicker cable than their 4-wire 26AWG variants such as the Thor II and Lionheart, the Ares II 8W is naturally a little heavier and not quite as plaint during handling. You really can’t beat the laws of physics on this one but I do think EA has done a great job in minimizing the load in a few key areas. The first is the use of their EA Ultra-Flex jacket which uses a translucent PVC material to keep the handling very controlled, tangle free and prevent any stiffness from creeping in. Compared to say the 22AWG ALO Audio SXC 8’s FEP jacket it is a lot softer and less bouncy. I can also bend and shape the ARES II 8W cable very easily and with minimal resistance. Pretty good for a chunky monkey! The second area is the braiding. Now the 8-wire braid is technically only available as a bespoke request but I 100% recommend you put in that request because the braid work on the Ares II 8W is beautiful. This combined with the translucent Ultra-Flex PVC jacket and the color of the wiring itself makes it one of the most visually striking cables you will ever see at this price point. EA braiding is tight with short throws, shorter than Astral Acoustics or Whiplash and on par with Plussound. The tighter braiding combined with the softer PVC materials makes the Ares II 8W much easier to bend and manipulate than some competing 8-wire models. This particular Ares II 8W cable is a standard 1.2m length and terminated with a 0.78mm 2-pin socket design. 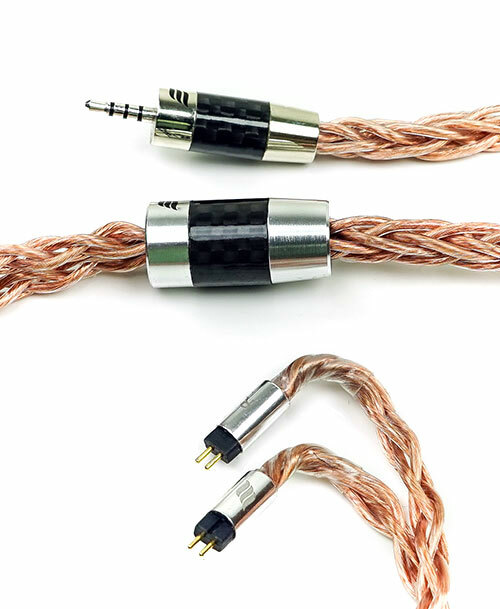 The 2-pin connectors are encased in chrome finished aluminum tubes sporting Effect Audio’s logo on each and a carbon weave and chrome finished 2.5mm stereo jack on the other end. During your ordering process, you can opt for different terminations depending on your preferences. EA provide up to 11 different connector terminations including MMCX, JH Audio 4-pin, UE Pro and Fitear to name a few. You can also vary your jack termination with 2.5mm, 3.5mm unbalanced and balanced, 4.4mm, RSA, straight or right-angled. Comparing the Lionheart to the Ares II 8W I actually believe EA have slightly changed their finishing on their connector barrels. They are still the same size, chrome finish but the logo seems etched a little deeper than before. Not sure if that is a production running change or a quirk in my own unit. The jack barrels on the ARES II 8W also have a much wider opening on the rear end to accommodate the larger cable than the 4-wire variants. In-between you have a similar chrome and carbon weave alloy finish for the y-split barrel which does a really nice job of separating the wires and reducing any microphonics without adding too much additional overall weight to the cable. Just above you have a small silicone adjustable chin strap that doesn’t feel overly tight when moving up or down. Note the rugged barrel version used here is much bigger than the 4-wire mini variant. This is again due to the greater size and volume of cabling that needs to go through it. Strain relief on the ARES II 8W is inside each barrel as opposed to protruding soft rubber or plastic heat shrinks on the outside. You will see a small amount of heat shrink on the connector barrels, maybe 1-2cm at the most but this for me is more about ensuring the high volume of wiring stays stable inside the tube and for a little bit of contouring around the ear since its an over-the-ear design. Note the ARES II 8W does not really have a memory hook as such, just that small guide to help form the wire and nudge it in the right direction. The ARES II 8W is weighted enough to just settle and curve around your ear naturally. The weight of the cable on your ear may bear down on you comfort wise but it does not fly away or slide off. It is one of the better behaving cables because of the additional pliancy factor from the Ultra Flex materials. The lighter 4-wire cables from EA are a little comfier but then its just physics at play here. 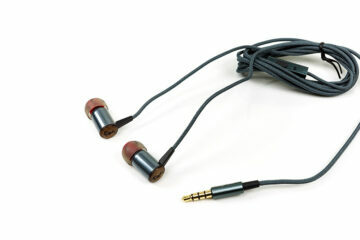 This is a bigger cable so you will feel more pressure on the back of your ear as a result. Also, give the size of the cable in terms of surface area you will get a slightly higher level of microphonics traveling up the wire than the smaller 4-wire. I tend to find that level of noise on larger cables par for the course. However, in context of the likes of the 22AWG Whiplash TWag V4, the ARES II 8W is much quieter so that is a brownie point right there to EA. Oh, we have a change here in terms of visuals. Gone is the traditional white and printed label EA box and in comes a more urbanite black slide case with fold-out inner lid. The outside packaging has the branding now on the bottom and the word Bespoke in the middle which, I guess, is what EA is all about. Open all that up and you can display the cable which sits in full view insides its foam basin. It’s a nice touch actually and a definite upgrade on the older packaging scheme. I do wonder if a magnetic cable organizer would be a nice additional extra for the Ares II 8W as well as a central pillar form the old box could have been retained. Still, as an entry level model for packaging, it is visually more appealing than before. will you review the OC studio OCauX? Our OC Studio reviews next are the Orpheus MK5 and then the Monarch.